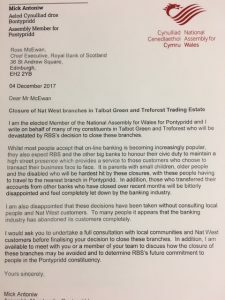 I am the elected Member of the National Assembly for Wales for Pontypridd and I write on behalf of many of my constituents in Talbot Green and Treforest who will be devastated by RBS’s decision to close these branches. Whilst most people accept that on-line banking is becoming increasingly popular, they also expect RBS and the other big banks to honour their civic duty to maintain a high street presence which provides a service to those customers who choose to transact their business face to face. It is parents with small children, older people and the disabled who will be hardest hit by these closures, with these people having to travel to the nearest branch in Pontypridd. In addition, those who transferred their accounts from other banks who have closed over recent months will be bitterly disappointed and feel completely let down by the banking industry. I am also disappointed that these decisions have been taken without consulting local people and Nat West customers. To many people it appears that the banking industry has abandoned its customers completely. I would ask you to undertake a full consultation with local communities and Nat West customers before finalising your decision to close these branches. 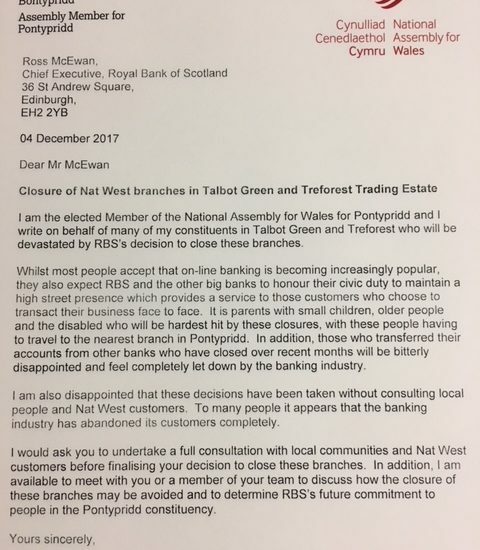 In addition, I am available to meet with you or a member of your team to discuss how the closure of these branches may be avoided and to determine RBS’s future commitment to people in the Pontypridd constituency.